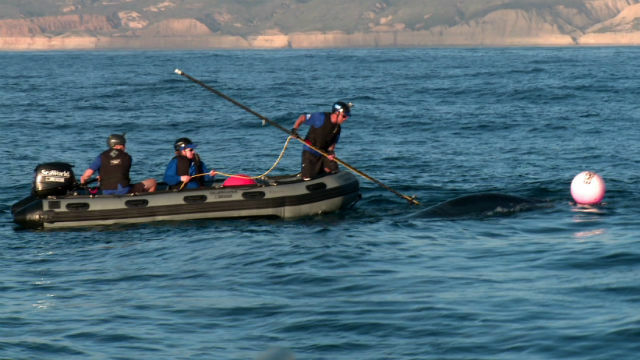 A team from SeaWorld San Diego on Sunday afternoon freed a 25-foot, year-old humpback whale that had become entangled in fishing line off La Jolla. SealWorld said its animal rescue team was alerted by California Department of Fish and Wildlife officials at 1 p.m. and was on scene by 3:15 p.m. They found the whale “hog-tied” with fishing line running through its mouth, pinning down its left pectoral flipper, and entangled around its tail fluke area. Over a two-hour period, the team cut away line from the animal’s mouth to its tail, finally allowing it to swim freely. The whale headed north in the direction of the normal migration pattern for humpback whales this time of year. “It was a phenomenal feeling to help an animal that otherwise would have drowned. This animal would have perished without our help. It’s a great feeling because we saved its life,” said Keith Yip, SeaWorld San Diego’s curator of mammals. SeaWorld came to the aid of six entangled whales last year. So far in 2016, the park has rescued more than 130 ill, injured or stranded sea lions and seals on the beaches of San Diego County.